KOOLTRONIC, INC., of Pennington, NJ, the leading manufacturer of air conditioners, heat exchangers, fans and blowers for electronic enclosures, announces the introduction of its new Fan and Blower Speed Controller. The Kooltronic Fan and Blower Speed Control, Model KSC100, is a solid state “smart” controller packaged in a NEMA 1 type enclosure for remote mounting. The allowable input power supply range is 95 to 250 Volts, 47 to 63 Hz. It is furnished standard with an IEC 320 connector, a power supply fuse and a temperature sensor. Additional temperature sensors are optional. The controller will operate single or multiple fans or blowers of compatible voltage and frequency up to a combined load of 6 Amps. The controller may be operated by either a control voltage signal of 0 to 10 VDC, a control current signal of 0 to 20 mA or one to three temperature sensors. With multiple temperature sensors, the controller will respond to the highest sensed temperature. The control circuit board is furnished with a terminal strip for connecting the sensor and fan wires. 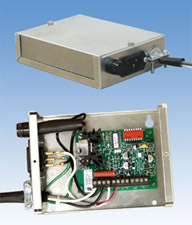 A pressure type strain relief connector is furnished in the enclosure. If required by the installation or by code, this connector can be replaced with a ½ inch trade size conduit connector. A wide variety of control logic options can be field programmed into the controller by means of a board mounted DIP switch. These include fan idle or starting speed at 30%, 40%, 50% or 60% of supply voltage, fan on or off below the idle setting, control temperature setting of 86ºF (30ºC), 95ºF (35ºC), 104ºF (40ºC), 113ºF (45ºC), and temperature differential settings of 7ºF (4ºC) and 18ºF (10ºC). The selectable fan on/off feature is operative when the temperature(s) drop below the control temperature setting.